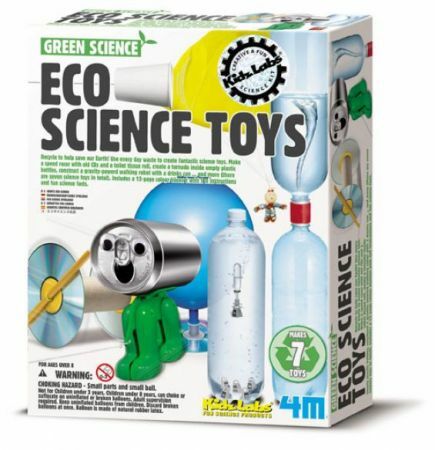 Make 7 eco science toys making use of recycling materials: Space sound walkie talkie, CD racer, Gravity robot, Hover disc, Shopping bag parachute, Cartesian diver and Tornado tube. Contents: walking structure for use in the Gravity robot, can holder, moving eyes, cap connector, 2 bottle caps, mouth peice, CD connector,balloon, 2 tube ends, 2 rubble bands, hook, dropper, 3 copper washers, 6 plastic weights, score label, elastic silver string, nuts, wooden bead, pipe cleaner, string, double adhesive tape and detail instructions. Not provided are recycling materials of drink can, 3 plastic bottles, 3 CD, 2 paper cups, shopping bag and 1 toilet paper roll's cardboard core.